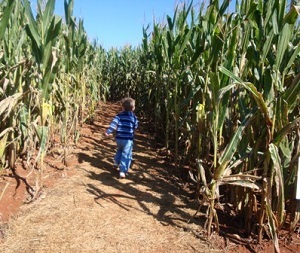 Looking for a local corn maze or hayride in Phoenix and Surrounding Counties in Arizona? Scroll down this page and you will see the all of thoses in Phoenix and Surrounding Counties in Arizona, sorted by county. Some are huge corn mazes with hayrides, pumpkins, corn cannons, inflatables and others are simple corn mazes with little else. Most also have loads of pumpkins to choose from. To really make it fun for your kids, look for those that have the extra activities, like a corn cannon, cow train, inflatables, farm animals, pumpkin patch or zip lines. There is usually a small fee for the mazes (of course, the more elaborate mazes tend to charge more. Hayrides are often free. ALWAYS call before you go to confirm the info, they don't always report changes to me! 7010 N. 177th Ave, Waddell, AZ 85355. Phone: 623-535-0013. Alternate Phone: 602-859-3149. Fax: 623-535-0013. Email: DbarTstables@aol.com. Directions: All of our services in Arizona are brought to your location. A visitor writes on September 24, 2011: Our Daisy Girl Scout troop visited your Pumpkin Patch yesterday and had a wonderful time. They played horseshoes, roped the hay bale bulls, played in the hay maze, took the hay ride to the pumpkin patch, pet the animals and rode the horses. They we busy and active the entire time we were there and your team made it such memorable event for the girls. Every member of your staff was friendly and warm and it showed that they all enjoy their jobs and love working with kids. We had such a great day and will be making a visit to your Pumpkin Patch an annual troop event! Thank you for all you do! Girl Scout Troop 2xxx"
A visitor writes on October 18, 2009: "A lot of fun for our 15 month old daughter. The fee to get in covers hay rides, face painting, a bounce house, petting zoo, a little pumpkin for your child to decorate, playground style areas, and picnic areas. A good time for kids and adults alike and conveniently located as well!" Schnepf Farms - corn maze, pumpkins, hayrides, pig races, pumpkin decorating, make your own scarecrow, live music, bonfire. (UPDATED: September 15, 2018, JBS) See comments about this farm here! A visitor writes: "They have free parking, restrooms and easy access from both the 60 and 202 freeways on Power Road, between Elliot and Warner roads in East Mesa. Discounts are available on the website. Children 5 & younger get in free to the corn maze with paid adult .Beautiful pumpkins and fresh kettle korn and much more available." 690 West Road 5 North, Chino Valley, AZ 86323. Phone: 928-636-2804. Fax: 928-636-2804*9. Email us at: colliers@localnet.com. A visitor writes on August 06, 2009: "My wife and I were just there a couple of weeks ago with our nine-month-old daughter, Skylar, and there was a tractor busily tending the huge pumpkin patch, which looks really healthy this year. I don't think they're doing the big festival anymore, but the farm is still there and open for business!" 1096 East Road 3 South, Chino Valley, AZ 86323. UPDATE: September 06, 2015: The owner tells me they are now permanently closed.